As the portabealla mushroom ripens (remember a mushroom is the fruiting body of a fungus, so really it is more like an ripening fruit than anything else) the veil which covers the gills from the edges of the cap to the stem begins to part and the gills begin to open. 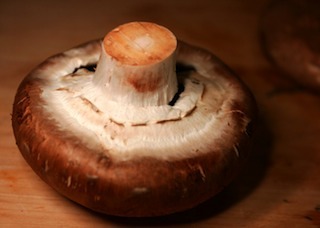 This process is because in the growth cycle of the fungus the mushroom is the fruit which bears the spores (like seeds). The spores are inside the gill structure, and the portabella mushroom has evolved such that it grows up above the duff supported by the stem, the veil protects the gills and spores as the mushroom attains its height, then the cap begins to grow out and more importantly spread out and flatten and the gills open and drop spores. Hence, a young portabella will still have the veil intact and the gills will be largely closed behind the gills. An young portabella mushroom with the veil largely intact. The immature portabella mushroom also had a greater water content than the mature portabella mushroom - so from the point of view of shopping for portabellas you are paying for more water in the portabella when you buy it 'young'.